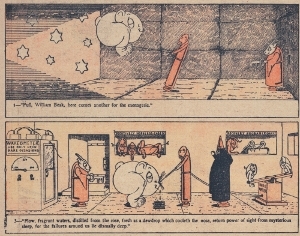 Thu, November 1, 2018 6:30 P.M.
Herbert Edmund Crowley was an almost entirely forgotten artist, sculptor, musician, and cartoonist upon his death in 1937. At one time during the early 20th. century he was seen as a rising star in the art world, but like many of the "lost generation," WWI as well as his own personal insecurities took him away from the public eye. The Temple of Silence, a monumental art book detailing his life and works was published in 2017 by Beehive Books, a Philadelphia-based publisher. Author Justin Duerr will detail the many years of research, which included some use of the Free Library's off-site collections, and tell the story of Crowley's life, his subsequent obscurity, and the context of his era. The story of the research required to uncover the story - which included excursions into academic archives, libraries, and even some amateur archeology, will also be touched on.